Whence I see these vintage sewing machines that were usually manual, they remind me of the grandmother’s era when they used to spend most of their time in sewing clothes for their kids and grand children as well. But now they are discarded and no more in use at all. May be in some remote areas. 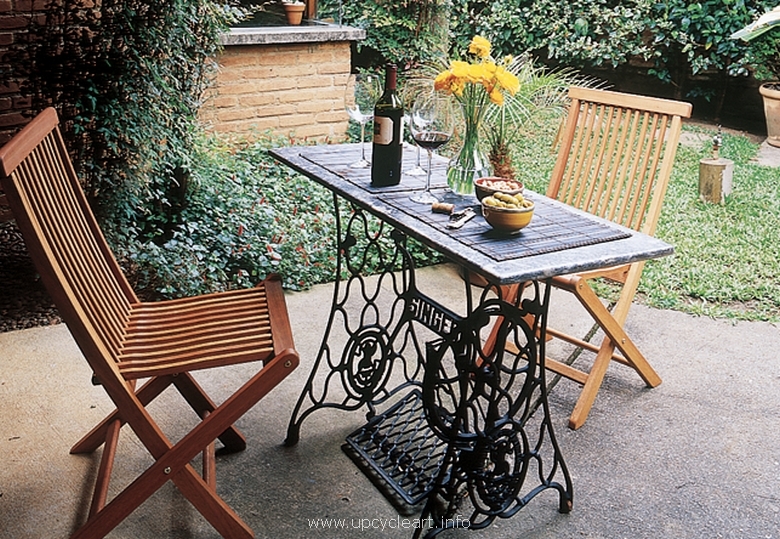 Even to us this was just a piece of scrap but then we suddenly realized that they are made with purest wrought iron, why not to recycle them and try some furniture ideas with them? 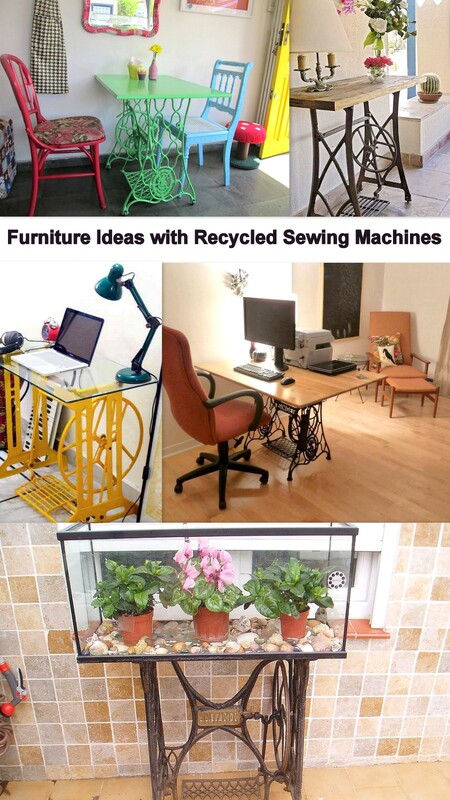 We have composed a whole long list of furniture ideas with recycled sewing machines. 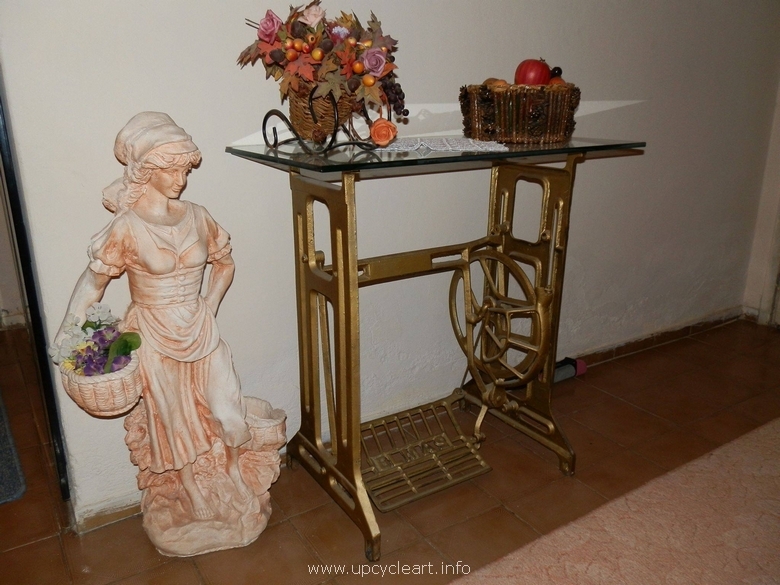 We have started with this classic table as this was probably the something that could best be made with this metallic stand. 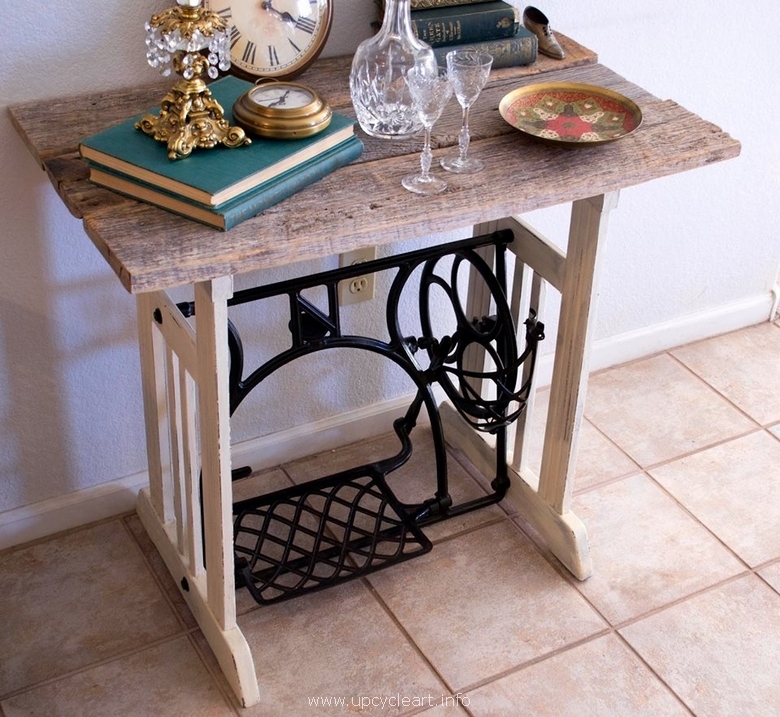 Although we could have made some changes but initially we just intended to make a simple table with this reclaimed sewing machine base. 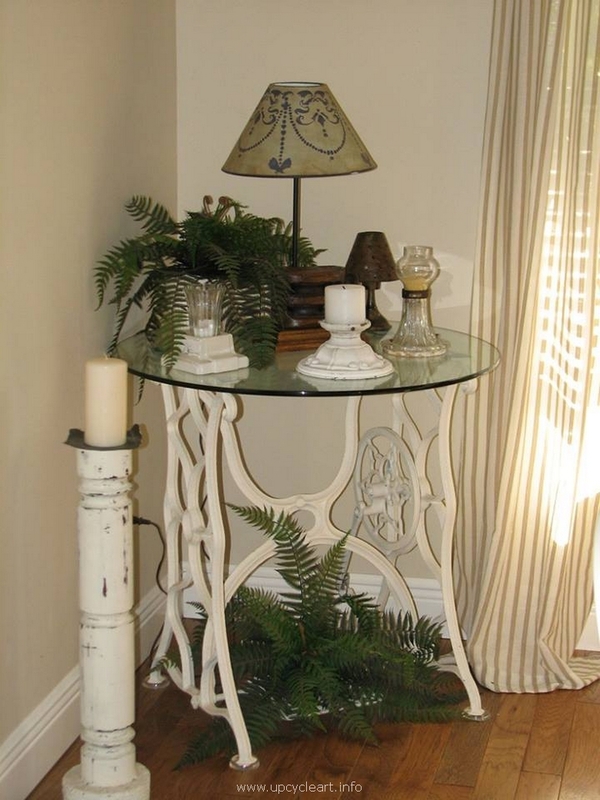 Look at this beautiful side table that is brought out of the house this time because the material that is used in making this side table is pretty hard enough to tolerate all extreme weather conditions so just don’t get worried about this. It would look on the front or main door. 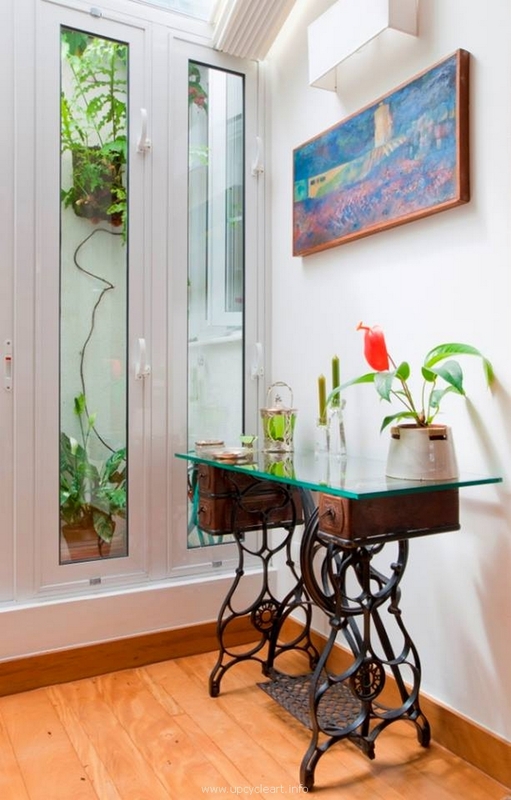 While this one is a typical side table that is normally placed on some cornered and isolated areas but hang on, we actually used a transparent glass top this time right? 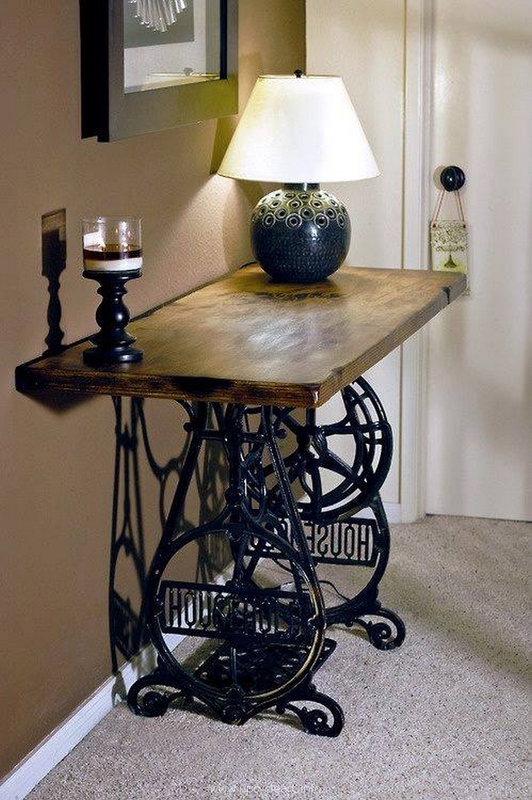 This industrial recycled table actually looks awesome having such a shiny metallic surface. 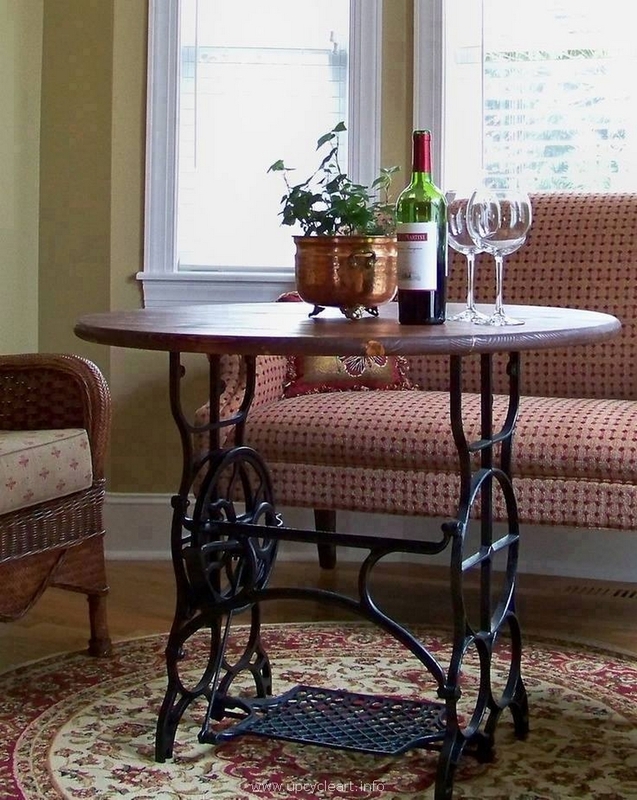 When you have this lower frame of the old sewing machine, the easiest thing that could be done with it is recycling a table of any kind like a side table, or a simple coffee table as this provides you a pretty solid and stylish base on which you can try various tops. Well, this aquarium was meant to stay raised from the ground or else this would have broken so far by the kids. And I just couldn’t find a better way to keeping it up from the ground than putting it on this recycled sewing machine. 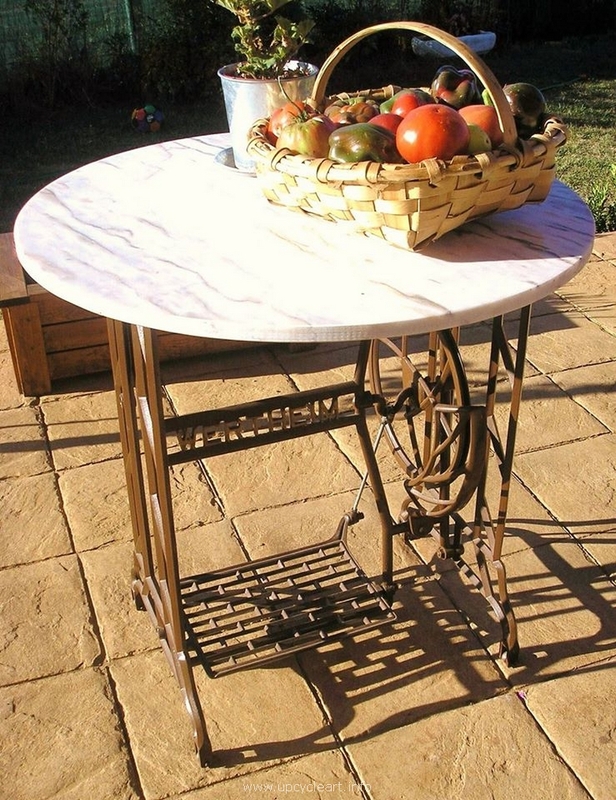 Even in outdoors this would look really cool if you make some table out of this recycled sewing machine. 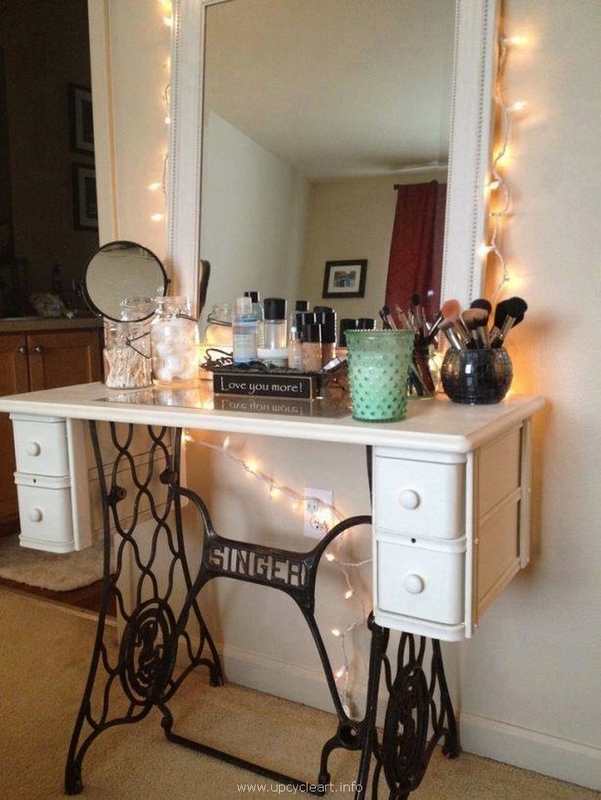 The reason is that the machine carries a very smart classic look that gives your furniture item a vintage look while enhancing the outlook of the furniture article as we see here. 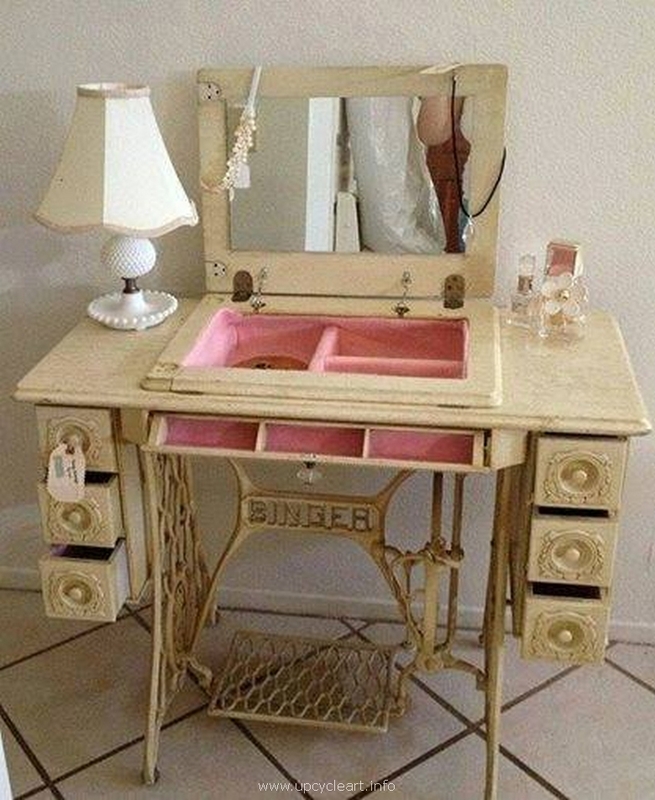 What have we done here, like we have a got a whole full fledge dressing table that has also got a vanity box built inside it. We could have simply make the legs with wood but the sewing machine bottom seemed a much better choice and we just tried it. Even this light weight slim table that is meant for a couple of persons is again made with the same material that we are talking about. The best thing about this sewing machine is that you can give it any shade and color according to the situation and surroundings as well. 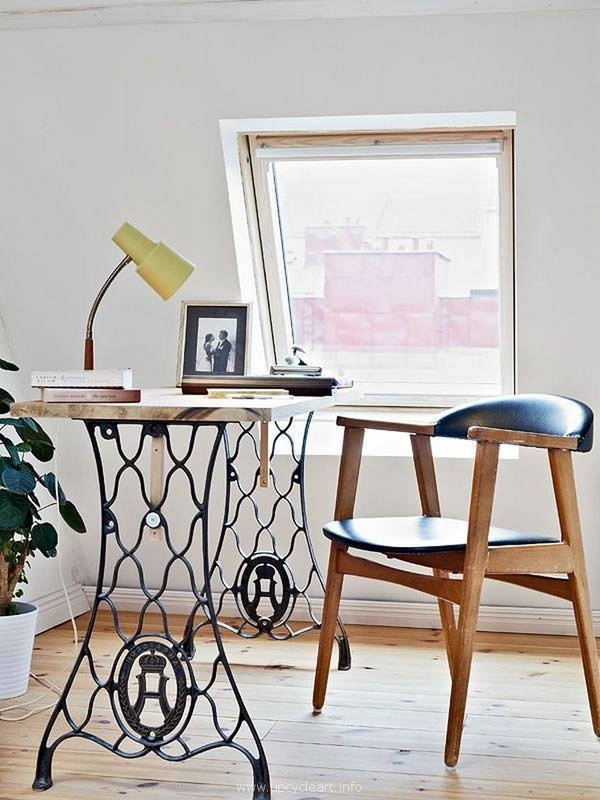 Look closely at this decent side table with a wooden top. 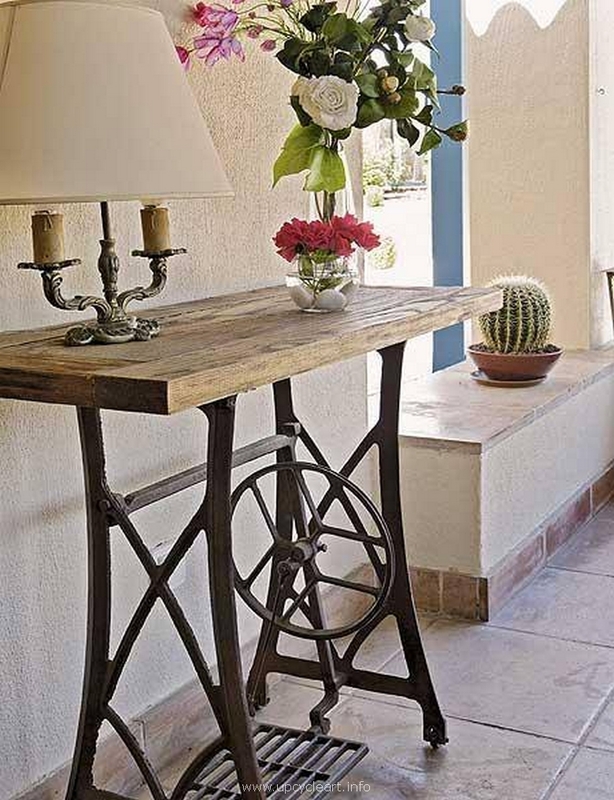 This wooden slab is added here to give this side table a perfectly typical shape. While the sewing machine base seems pretty fresh, it was actually stained with jet black shade again to give it a new life. 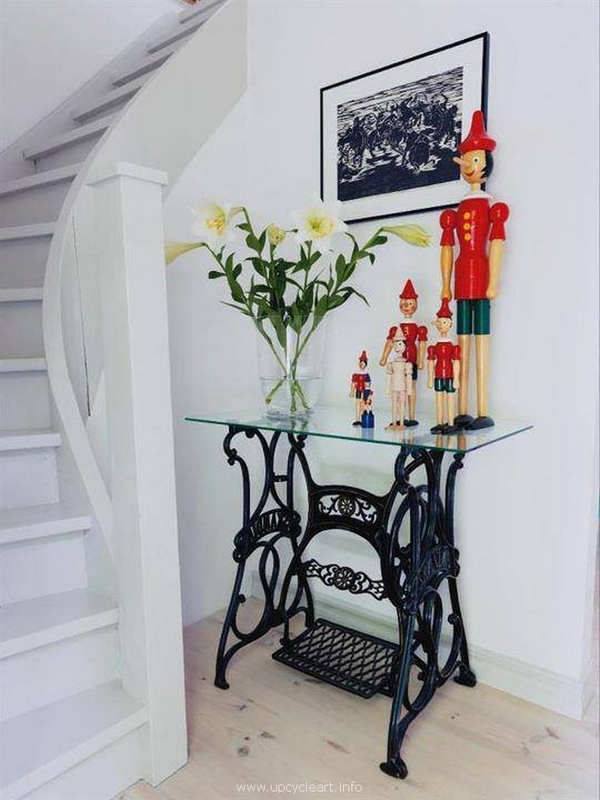 Some of you might find this one inappropriate for you lavishly decorated house but trust me it has got nothing to do with the show off material, this is actually something that is close to the art and simply made art crafts using some waste material. In this regard it still looks pretty awesome. Again we have got here a full frame of a wooden dressing table that was meant to be this much high. 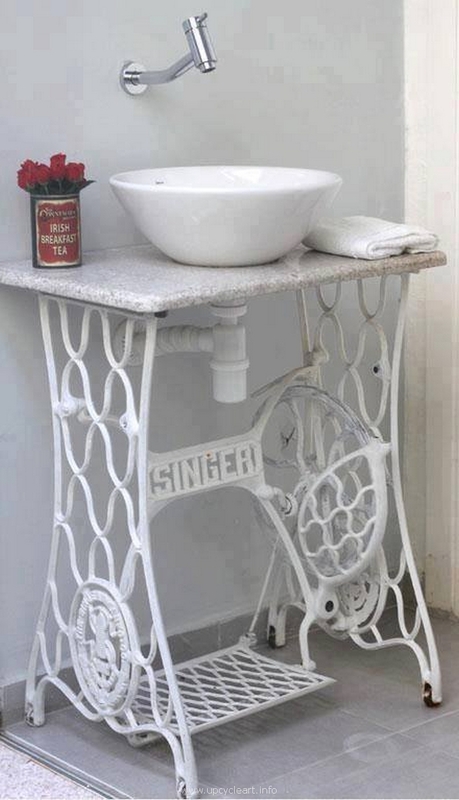 But just to bring about a change and to show a contradiction to the typical stereotype ideas we this time erected this sewing machine on the base. 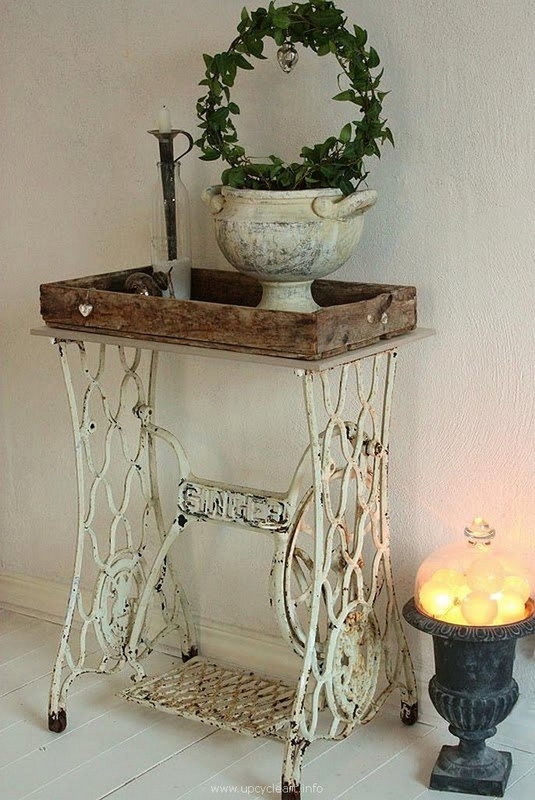 I think the finishing of this metallic sewing machine is far easier than the treatment of wood pallet. 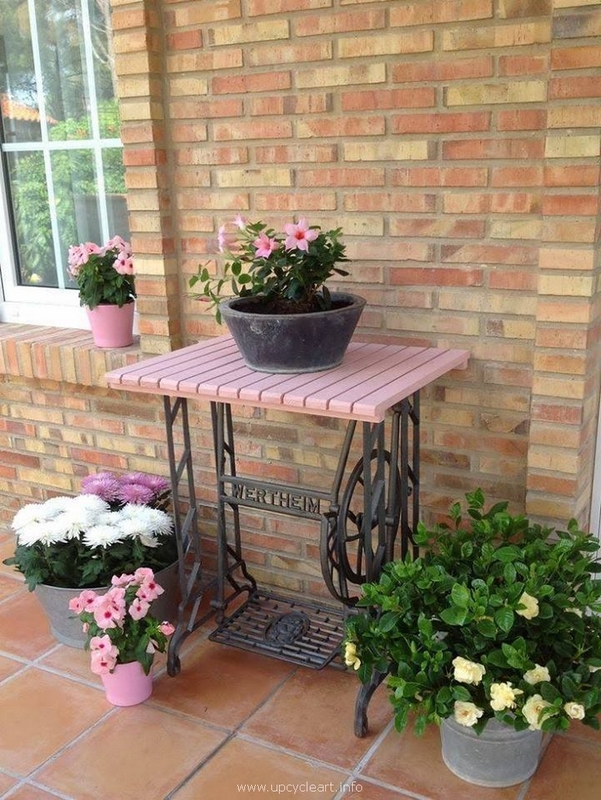 Here you simply have to arrange a common sand paper for iron, do some gentle sanding if needed, and just stain it with a spray gun that is a hundred times easier. 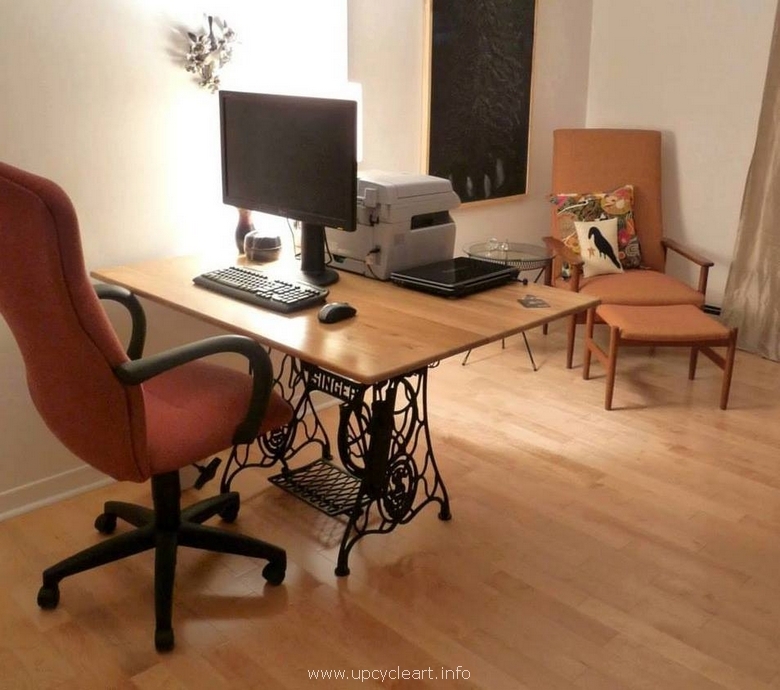 Bear in mind that when you are intending to recycle it for making some furniture item for indoor, make sure that you have done some fine finishing on it which have been elaborated earlier. This is not going to cost you much at all. Only then this would make perfect appearance otherwise it could harm your rest of interior with its nasty and aged look. 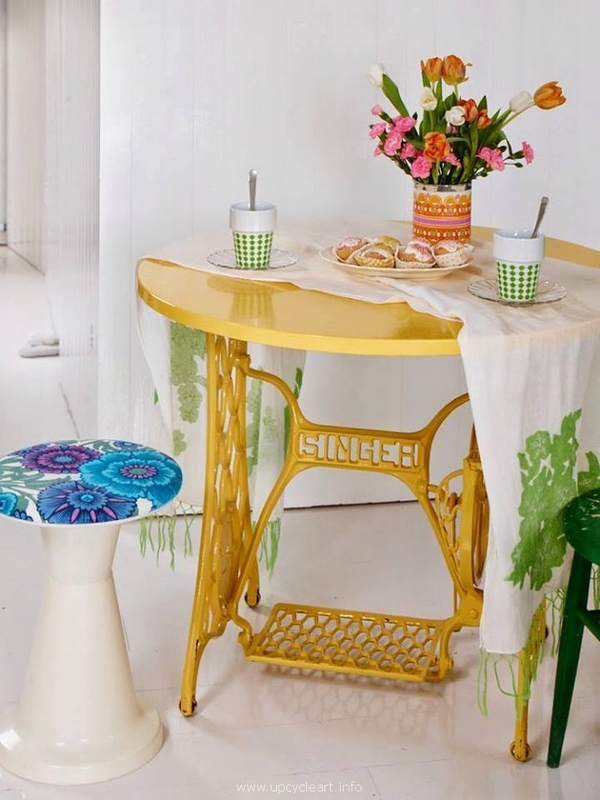 To make a simple side table with this recycled sewing machine I guess is the simplest thing that you can do in a couple of hours. 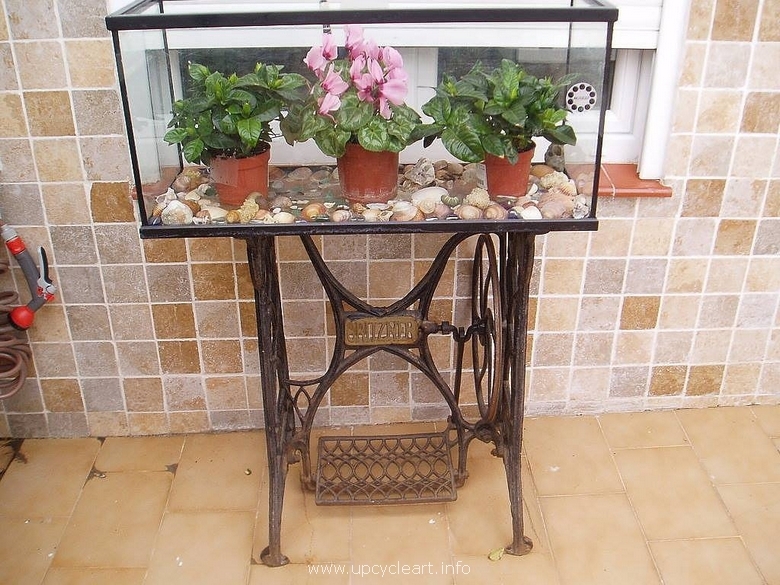 And trust me nobody is going to judge that you have recycled an old piece of trash, they would take it as something antique and expensive. In all of the projects we have seen that this sewing machine cannot make anything at its own unless we haven’t got a strong idea with some appropriate material to be mixed with this. Here we have done something different like we have used a pair of similar sewing machines. They are perfectly same in size and shape. And we have made a single wide and long table out of them. 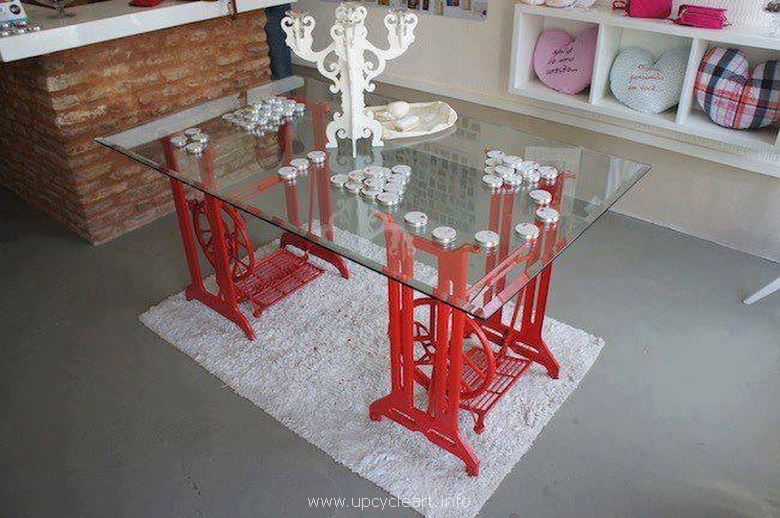 Looking at the size we can also use it as a proper dining table as well. 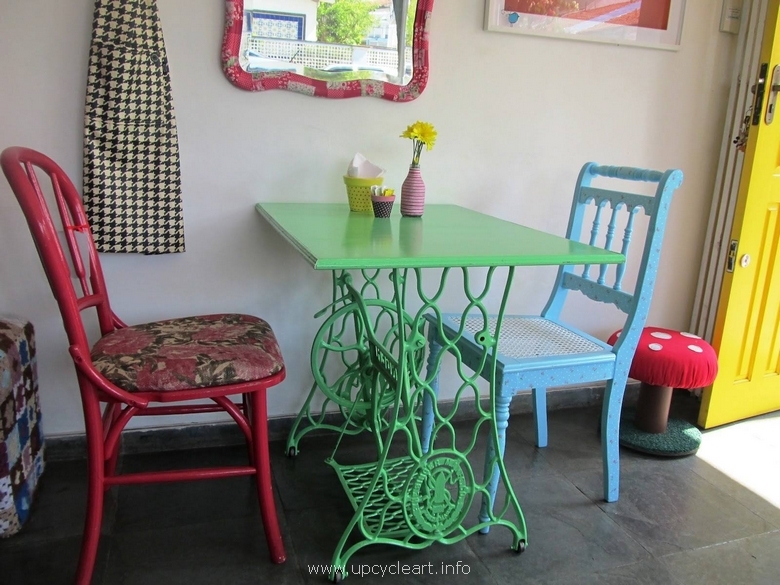 This is another aspect of the sewing machine recycled furniture ideas. 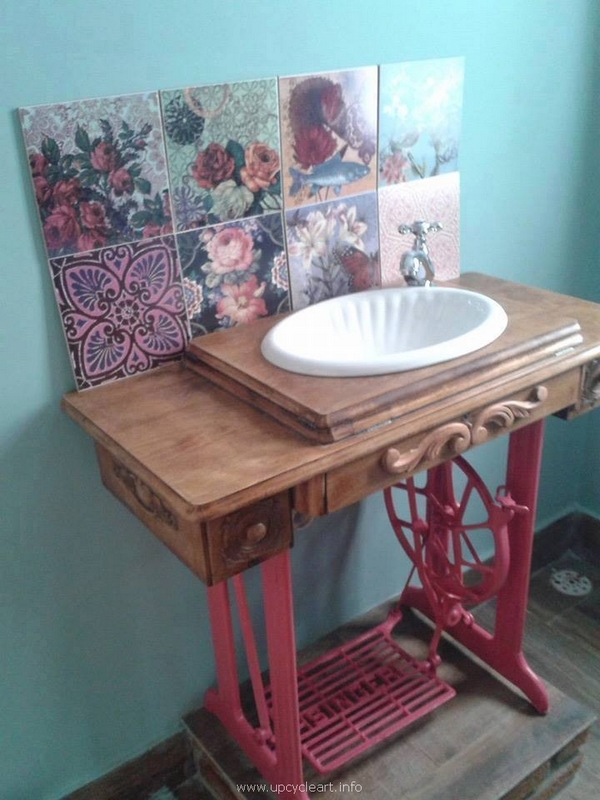 This time we have installed it inside the bathroom carrying this ceramic sink, and the table top is made of the precious marble, this would definitely give a livelier and artistic touch inside your bathroom and an idea that rarely would have been adopted. 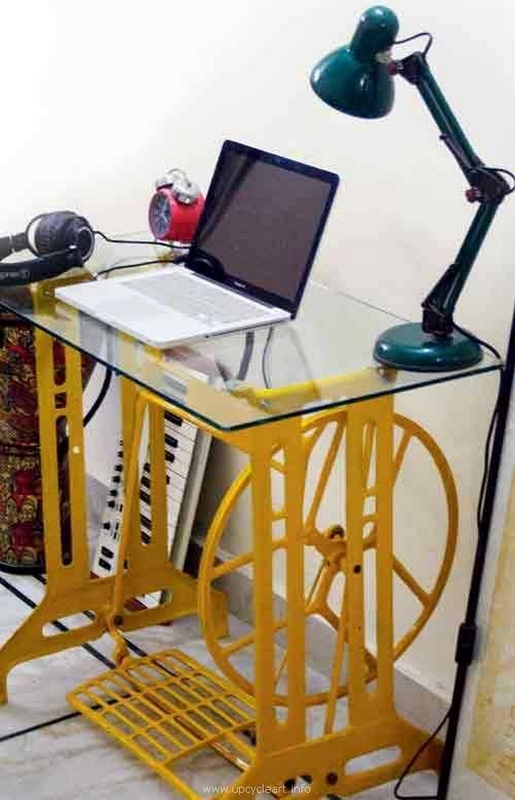 To present this desktop table we just wanted to show that it is totally upto you that how exactly you have to use it, once you have made a recycled table using this metallic sewing machine, you can put it to use the way you like.